See Grants in June, No. 32. 770. Cranmer to Henry VIII. 771. Sir Edw. North to Mr. Hanby. Requiring him to send, written on parchment, the particulars of Marston parsonage and “deary,” Derb., which belonged to Tutbury monastery. My house in London, 11 June. Signed. P. 1. Add. : auditor of Augmentations. Commission to Dr. George Hennage, archd. of Taunton, John Hennage, and the King's servants John Hallelie and Robt. Draper, to take down and convey to the Tower of London a certain shrine and divers feigned relics and jewels in Lincoln Cathedral, by which simple people are deceived and brought into superstition and idolatry, together with all superfluous jewels, plate, copes, and the like, at their discretion. Westm., 6 June 32 Hen. VIII. 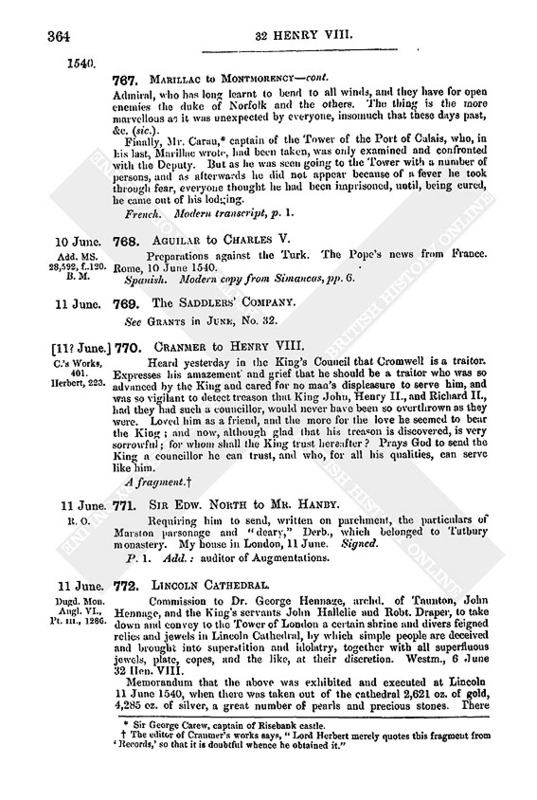 Memorandum that the above was exhibited and executed at Lincoln 11 June 1540, when there was taken out of the cathedral 2,621 oz. of gold, 4,285 oz. of silver, a great number of pearls and precious stones. There were then two shrines there, one of gold of St. Hugh and one of silver of St. John of Dalderby (describes where they stood). ii. Description of the bp. of Lincoln's mitre. The above printed by Dugdale between extracts from the register of the dean and chapter of Lincoln, but without reference. 773. Francis I. to the Duke of Norfolk. Thanks for a present of four greyhounds delivered by the English ambassador. Commends the ambassador's conduct. (fn. 2) Fontainebleau, 11 June 1540. Signed. Fr., p. 1. Add. Endd. Countersigned: Bochetel. 774. Charles V. to James V.
Requires him to do justice in the case of certain fishermen of Ostend who have been robbed by Robert Fogo, a Scottish pirate, as appears by certificate enclosed. Brussels, 11 June 1540. Copy, pp. 2. Faded and mutilated. 775. Council of England to Sir Wm. Brereton, the Abp. of Dublin, and the Master of the Rolls in Ireland. Since writing their other letters by bearer, Lord Leonard, late deputy, is committed to the Tower. Understand he has good substance there which they must put in safe custody, and also examine Arnold Usher, of Dublin, about treasure committed to him; and send an inventory. In Wriothesley's hand. Endd. : Minute to Sir Wm. Brereton, the Abp. of Dublin, and Master of the Rolls in Ireland, 12 June. 776. Cromwell to Henry VIII. Prostrate at your Majesty's feet, I have heard your pleasure by your Controller, viz., that I should write such things as I thought meet concerning my most miserable state. And (1) where I have been accused of treason, I never in all my life thought to displease your Majesty; much less to do or say “that thing which of itself is so high and abominable offence.” Your Grace knows my accusers, God forgive them. If it were in my power to make you live for ever, God knows I would; or to make you so rich that you should enrich all men, or so powerful that all the world should obey you. For your Majesty has been most bountiful to me, and more like a father than a master. I ask you mercy where I have offended. Never spoke with the Chancellor of the Augmentations and Frogmerton together at a time; but if I did, I never spoke of any such matter. Your Grace knows what manner of man Throgmerton has ever been towards you and your proceedings. What Master Chancellor has been to me, God and he know best; what I have been to him your Majesty knows. If I had obeyed your often most gracious counsels it would not have been with me as now it is. But I have committed my soul to God, my body and goods to your pleasure. As for the Commonwealth, I have done my best, and no one can justly accuse me of having done wrong wilfully. If I heard of any combinations or offenders against the laws, I have for the most part (though not as I should have done) revealed and caused them to be punished. But I have meddled in so many matters, I cannot answer all. The Controller showed me that you complained that within these 14 days I had revealed a matter of great secrecy. I remember the matter, but I never revealed it. After your Grace had spoken to me in your chamber of the things you misliked in the Queen, I told you she often desired to speak with me, but I durst not, and you thought I might do much good by going to her and telling her my mind. Lacking opportunity I spoke with her lord Chamberlain, for which I ask your mercy, to induce her to behave pleasantly towards you. I repeated the suggestion, when the lord Chamberlain and others of her council came to me at Westminster for licence for the departure of the strange maidens. This was before your Grace committed the secret matter to me, which I never disclosed to any but my lord Admiral, (fn. 3) by your commandment on Sunday last; whom I found equally willing to seek a remedy for your comfort, saying he would spend the best blood in his belly for that object. 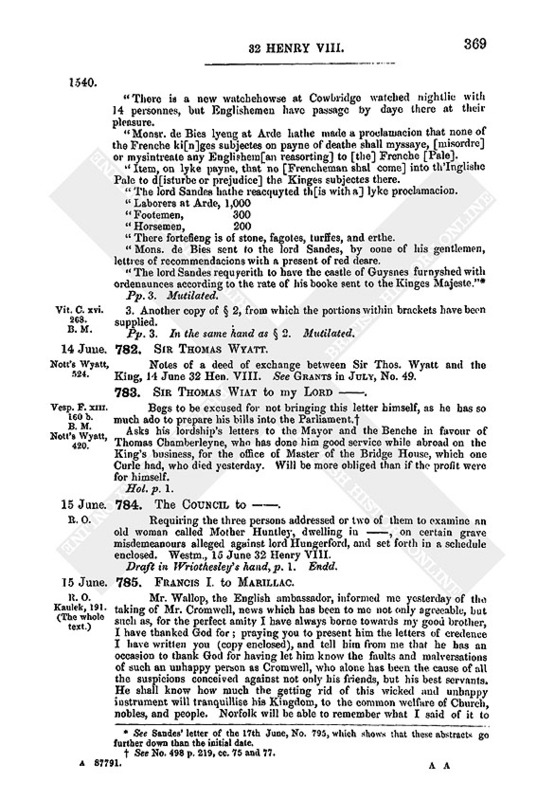 “The tenor of the proclamation at Guisnes, Saturday, the 12th of June the 32nd year of the reign of our Sovereign lord the King,” issued by lord Sandys, forbidding any soldier or laborer of the castle to enter French territory without his licence on pain of death; or to “missay or misorder” any French subjects coming for victuals; with other regulations to secure freedom to the victuallers and good watch in the town. Wrote nothing in his last of Perowse because the news was uncertain; but Randolf Baylion, son to Malteste, has entered the town with 200 foot and 100 horse, having been chosen for their lord, assisted, it is supposed, by the Florentines, Lucchese, and Siennese, who feared that the bp. of Rome would have the said towns by the Emperor's consent. The duke of Florence is also opposed to the Bishop, and tried to prevent the Spaniards helping him, by the viceroy of Naples, whose daughter he has married; and if the Pope had not given them two pays they would not have served. The Almains will not come to him unless he give them three pays. Letters from Venice state that they have taken peace with the Turk, giving him Napoli de Romagna and Malvasia and 300,000 crs. Francis rejoiced on hearing this, and sent early for the Venetian ambassador. The Constable, passing this way on Wednesday, affirmed the same with much joy. His wife, before he came, met with many of the Court here. There is no more talk of the Admiral's coming. Francis leaves Fontainebleau on Monday for Paris, where he will remain 8 or 10 days, and go to Batefyll, in Normandy, 6 or 7 leagues from Rouen, and on to Havre de Grace, intending to make more galeasses, as he hears so good an account of those he sent to the Levant with corn, which are now at Marseilles to lade for Alexandria. He does not mean his vessels to rot in harbour. He has discharged 15 of his galleys “subtilles.” He is not inclined to war, nor to assist the Emperor against the Turk; “and what resistance can the Emperor make against him (the Turk?) if his power come to ‘townnes’ (Tunis?) lacking the Venetians' and the French king's aid?” Andrew Doria has but 40 galleys. The Turk has rigged this year 200 new galleys, “and what Barbarossa had before I need not to express.” This Venetian news will not be so pleasant to the Emperor. Has sent by the Imperial ambassador a packet of letters from Mons. St. Pol to their ambassador in favour of Torre for his deliverance, and if they will not deliver him to know why. Myllon, 12 June. Signed. 779. James V. to Charles V.
About 55 years ago a Scottish ship whose captain was John Bertoun, a Scot, in coming from Flanders and Zealand was attacked and captured by ships of the fleet of Portugal. The writer's grandfather, James III., wrote to the king of Portugal, but could get no redress; and Charles duke of Burgundy, within whose rule the ship was taken, also wrote, but without effect. James III. thereupon granted letters of reprisal, but would never permit them to be executed. The writer's father renewed these letters of reprisal to Robert and John Bertoun, sons and heirs of the forsaid Bertoun, but never permitted their execution. Now an active youth, John Bertoun, heir of the preceding, presses for the same concession his grandfather, father, and uncle had, and James can hardly refuse it. Edinburgh, 12 June 1540. 12 June 1540. Proposal made at Hagenau, in Alsace, by the king of the Romans to the Catholic princes of the Empire. 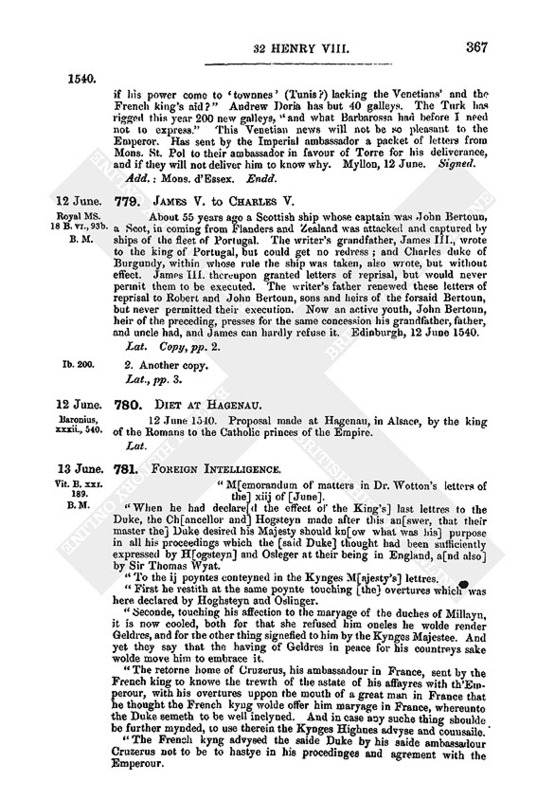 “M[emorandum of matters in Dr. Wotton's letters of the] xiij of [June]. 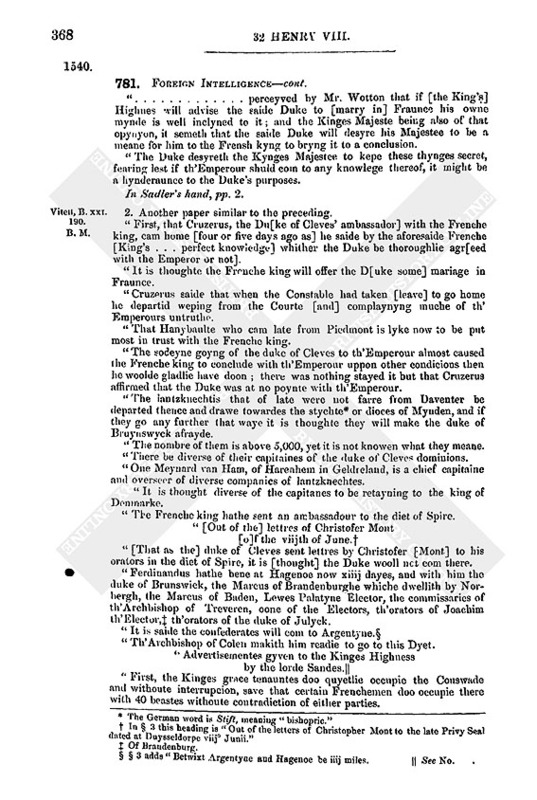 “When he had declare[d the effect of the King's] last lettres to the Duke, the Ch[ancellor and] Hogsteyn made after this an[swer, that their master the] Duke desired his Majesty should kn[ow what was his] purpose in all his proceedings which the [said Duke] thought had been sufficiently expressed by H[ogsteyn] and Osleger at their being in England, a[nd also] by Sir Thomas Wyat. “To the ij poyntes conteyned in the Kynges M[ajesty's] lettres. “First he restith at the same poynte touching [the] overtures which was here declared by Hoghsteyn and Oslinger. “Seconde, touching his affection to the maryage of the duches of Millayn, it is now cooled, both for that she refused him oneles he wolde render Geldres, and for the other thing signefied to him by the Kynges Majestee. And yet they say that the having of Geldres in peace for his countreys sake wolde move him to embrace it. “The retorne home of Cruzerus, his ambassadour in France, sent by the French king to knowe the trewth of the astate of his affayres with th'Emperour, with his overtures uppon the mouth of a great man in France that he thought the French kyng wolde offer him maryage in France, whereunto the Duke semeth to be well inclyned. And in case any suche thing shoulde be further mynded, to use therein the Kynges Highnes advyse and counsaile. “The French kyng advysed the saide Duke by his saide ambassadour Cruzerus not to be to hastye in his procedinges and agrement with the Emperour. “… perceyved by Mr. Wotton that if [the King's] Highnes will advise the saide Duke to [marry in] Fraunce his owne mynde is well inclyned to it; and the Kinges Majeste being also of that opynyon, it semeth that the saide Duke will desyre his Majestee to be a meane for him to the Frensh kyng to bryng it to a conclusion. “The Duke desyreth the Kynges Majestee to kepe these thynges secret, fearing lest if th'Emperour shuld com to any knowlege thereof, it might be a hynderaunce to the Duke's purposes. In Sadler's hand, pp. 2. 2. Another paper similar to the preceding. “First, that Cruzerus, the Du[ke of Cleves' ambassador] with the Frenche king, cam home [four or five days ago as] he saide by the aforesaide Frenche [King's … perfect knowledge] whither the Duke be thoroughlie agr[eed with the Emperor or not]. “It is thoughte the Frenche king will offer the D[uke some] mariage in Fraunce. “Cruzerus saide that when the Constable had taken [leave] to go home he departid weping from the Courte [and] complaynyng muche of th'Emperours untruthe. “That Hanybaulte who cam late from Piedmont is lyke now to be put most in trust with the Frenche king. “The sodeyne goyng of the duke of Cleves to th'Emperour almost caused the Frenche king to conclude with th'Emperour uppon other condicions then he woolde gladlie have doon; there was nothing stayed it but that Cruzerus affirmed that the Duke was at no poynte with th'Emperour. “The lantzknechtis that of late were not farre from Daventer be departed thence and drawe towardes the stychte (fn. 5) or dioces of Mynden, and if they go any further that waye it is thoughte they will make the duke of Bruynswyck afrayde. “The nombre of them is above 5,000, yet it is not knowen what they meane. “There be diverse of their capitaines of the duke of Cleves dominions. “One Meynard van Ham, of Harenhem in Geldreland, is a chief capitaine and overseer of diverse companies of lantzknechtes. “It is thought diverse of the capitanes to be retayning to the king of Denmarke. “The Frenche king hathe sent an ambassadour to the diet of Spire. “[That as the] duke of Cleves sent lettres by Christofer [Mont] to his orators in the diet of Spire, it is [thought] the Duke wooll not com there. “Ferdinandus hathe bene at Hagenoe now xiiij dayes, and with him the duke of Brunswick, the Marcus of Brandenburghe whiche dwellith by Norbergh, the Marcus of Baden, Lewes Palatyne Elector, the commissaries of th'Archbishop of Treveren, oone of the Electors, th'orators of Joachim th'Elector, (fn. 7) th'orators of the duke of Julyck. “Th'Archbishop of Colen makith him readie to go to this Dyet. “First, the Kinges grace tenauntes doo quyetlie occupie the Couswade and withoute interrupcion, save that certain Frenchemen doo occupie there with 40 beastes withoute contradiction of either parties. “There is a new watchehowse at Cowbridge watched nightlie with 14 personnes, but Englishemen have passage by daye there at their pleasure. “Monsr. de Bies lyeng at Arde hathe made a proclamacion that none of the Frenche ki[n]ges subjectes on payne of deathe shall myssaye, [misordre] or mysintreate any Englishem[an reasorting] to [the] Frenche [Pale]. “Item, on lyke payne, that no [Frencheman shal come] into th'Inglishe Pale to d[isturbe or prejudice] the Kinges subjectes there. “The lord Sandes hathe reacquyted th[is with a] lyke proclamacion. “There fortefieng is of stone, fagotes, turffes, and erthe. “Mons. de Bies sent to the lord Sandes, by oone of his gentlemen, lettres of recommendacions with a present of red deare. 3. Another copy of § 2, from which the portions within brackets have been supplied. Pp. 3. In the same hand as § 2. Mutilated. Notes of a deed of exchange between Sir Thos. Wyatt and the King, 14 June 32 Hen. VIII. See Grants in July, No. 49. 783. Sir Thomas Wiat to my Lord —. Asks his lordship's letters to the Mayor and the Benche in favour of Thomas Chamberleyne, who has done him good service while abroad on the King's business, for the office of Master of the Bridge House, which one Curle had, who died yesterday. Will be more obliged than if the profit were for himself. 784. The Council to —. Requiring the three persons addressed or two of them to examine an old woman called Mother Huntley, dwelling in —, on certain grave misdemeanours alleged against lord Hungerford, and set forth in a schedule enclosed. 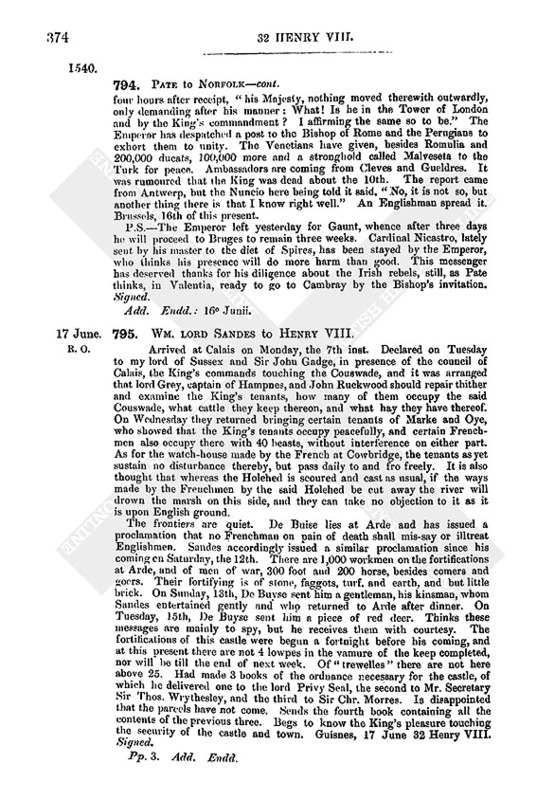 Westm., 15 June 32 Henry VIII. Draft in Wriothesley's hand, p. 1. Endd. 785. Francis I. to Marillac. Mr. Wallop, the English ambassador, informed me yesterday of the taking of Mr. Cromwell, news which has been to me not only agreeable, but such as, for the Perfect amity I have always borne towards my good brother, I have thanked God for; praying you to present him the letters of credence I have written you (copy enclosed), and tell him from me that he has an occasion to thank God for having let him know the faults and malversations of such an unhappy person as Cromwell, who alone has been the cause of all the suspicions conceived against not only his friends, but his best servants. He shall know how much the getting rid of this wicked and unhappy instrument will tranquillise his Kingdom, to the common welfare of Church, nobles, and people. Norfolk will be able to remember what I said of it to him when he was last in France; to whom you shall first communicate this Fontainebleau, 15 June 1540. Had gone to visit his house when he received Marillac's of the 1st, which he at once forwarded to the King. Yesterday Wallop came to see the King here, to which place the writer returned seven or eight days ago, and announced the arrest of Cromwell for the causes the King writes. It is a real miracle of God, who has inspired the King to extirpate such an unhappy and dangerous instrument, who has set him against his good friends and allies and loyal servants, and has been the cause of many actions which a million of lives, if he had them, could not [expiate? word omitted]. Marillac is to be guided by the King's letter of credence now sent, and send early word how the matter goes. Fortification of the frontiers proceeds rapidly. The King is well, and will visit “le Landit” (i.e., fair of St. Denis), and then return to Normandy. Fontainebleau, 15 June 1540. Commendations to Norfolk, to whom Marillac shall communicate as much as seems advisable of the King's letters, and say that affairs between the King and Emperor remain as before. 787. Roger Basyng to Cromwell. On the 10th arrived in St. Sebastian's in Le Pusqua (Guipuscoa) and coasted along into Biscay to Bylbo; but could perceive no preparation of ships for the wars, and if there was any [it would be here] “for by these quarters standeth the chief part of the navy of Spain.” They could not make war if they would: never saw the country poorer. Nothing is said of war against the Turk or any other. Spiteful persons, especially religious persons and priests, speak opprobriously of the King and Council and favour the Bp. of Rome. If they get an Englishman apart they speak of the Bishop's authority and take advantage of his words to present him to the Inquisitors. Has not communed of these matters; but they say the Bishop and Cardinals are Ecclesiam Catholicam, and whoever denies it should be burnt. For this cause alone a mariner born in Flanders and married in England was burned in Bylbo [awhile] ago. All the Englishmen who have been troubled for like matters are departed into England, save one, who tarries to make his full despatch, and is appointed to depart within 25 days. The marriages between France and Spain (fn. 12) are now little spoken of. Some say the Great Master of France is committed to ward, because the Emperor will not perform his promise about Milan upon the treaties of marriages, whereof he was first mover. The Great Master has asked licence to go to the Emperor and require their fulfilment, but is refused. This day, will depart towards Andalusia, and from thence after his despatch will return in haste to the Court. Bylbo, 15 June. Signed. 788. Montmorency to the Queen of Scotland. The King is as glad to hear of her having “ung beau filz,” and that she is doing well, as if she were his own daughter. The King makes good cheer and likewise the Queen, Messeigneurs, and Mesdames; also her father, from whom a messenger has just arrived. Fontainebleau, 15 June. Signed. Fr., p. 1. Add. Endd. : M. le Grand Maistre. 789. The Cardinal of Lorraine to the Queen of Scotland. Reply of the Catholics to the King of the Romans, 15 June 1540. Assay of silver made, 16 June 32 Hen. VIII., before Sir Thos. lord Audeley, Charles duke of Suffolk, Wm. earl of Southampton, lord Admiral, Cuthbert bp. of Durham, Steph. bp. of Winchester, John lord Russell, Sir Ant. Broun, Thos. Wriothesley, Ralph Sadler, Edw. Mountague, chief justice, and John Baldewyn, chief justice of Common Pleas. Total amount given of silver coins (groats, half groats, pence, halfpence and farthings), and of gold coins (double crowns of the rose and half crowns). John Broun, being keeper of the exchange, and Ralph Rowlett, and Martin Bowes, masters of the Mint. 2. 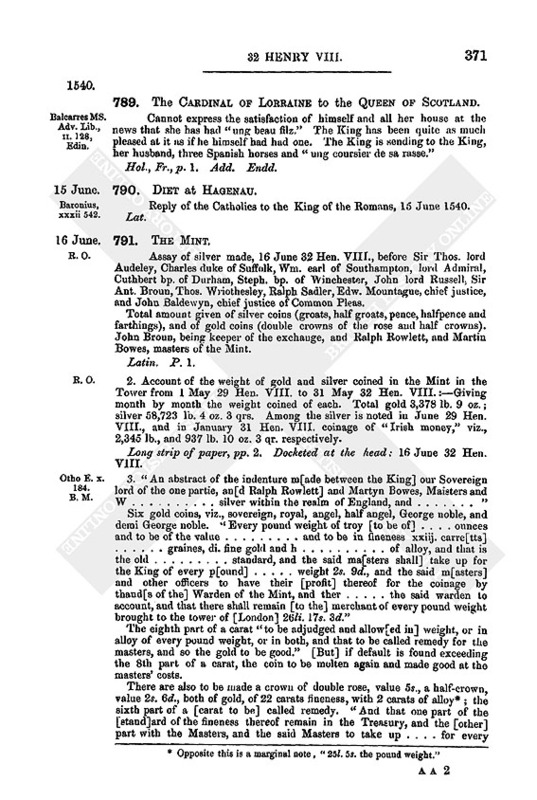 Account of the weight of gold and silver coined in the Mint in the Tower from 1 May 29 Hen. VIII. to 31 May 32 Hen. VIII. :—Giving month by month the weight coined of each. Total gold 3,378 lb. 9 oz. ; silver 58,723 lb. 4 oz. 3 qrs. Among the silver is noted in June 29 Hen. VIII., and in January 31 Hen. VIII. coinage of “Irish money,” viz., 2,345 lb., and 937 lb. 10 oz. 3 qr. respectively. Long strip of paper, pp. 2. Docketed at the head: 16 June 32 Hen. VIII. 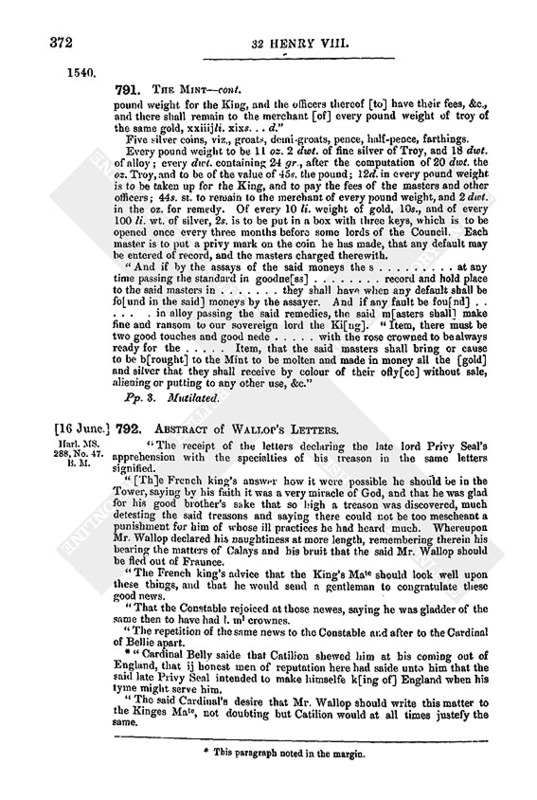 The eighth part of a carat “to be adjudged and allow[ed in] weight, or in alloy of every pound weight, or in both, and that to be called remedy for the masters, and so the gold to be good.” [But] if default is found exceeding the 8th part of a carat, the coin to be molten again and made good at the masters' costs. Five silver coins, viz., groats, demi-groats, pence, half-peace, farthings. Every pound weight to be 11 oz. 2 dwt. of fine silver of Troy, and 18 dwt. of alloy; every dwt. containing 24 gr., after the computation of 20 dwt. the oz. Troy, and to be of the value of 45s. the pound; 12d. in every pound weight is to be taken up for the King, and to pay the fees of the masters and other officers; 44s. st. to remain to the merchant of every pound weight, and 2 dwt. in the oz. for remedy. Of every 10 li. weight of gold, 10s., and of every 100 li. wt. of silver, 2s. is to be put in a box with three keys, which is to be opened once every three months before some lords of the Council. Each master is to put a privy mark on the coin he has made, that any default may be entered of record, and the masters charged therewith. 792. Abstract of Wallop's Letters. “The receipt of the letters declaring the late lord Privy Seal's apprehension with the specialties of his treason in the same letters signified. 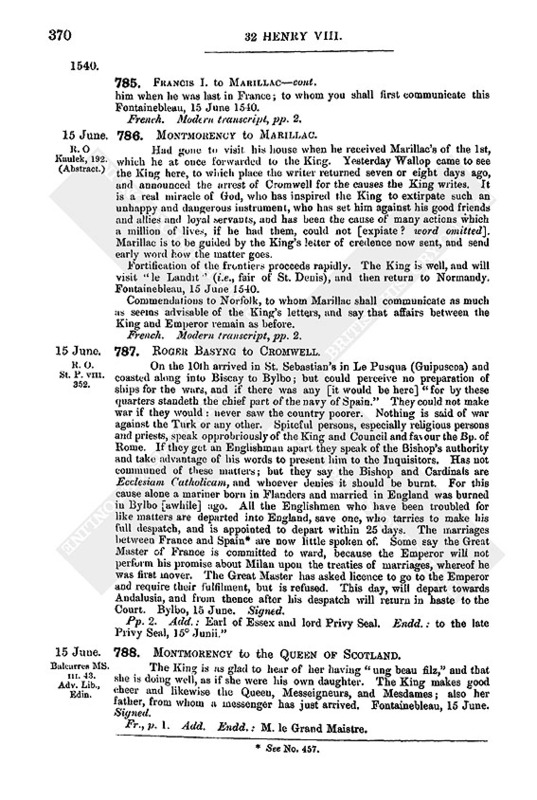 “[Th]e French king's answer how it were possible he should be in the Tower, saying by his faith it was a very miracle of God, and that he was glad for his good brother's sake that so high a treason was discovered, much detesting the said treasons and saying there could not be too mescheant a punishment for him of whose ill practices he had heard much. Whereupon Mr. Wallop declared his naughtiness at more length, remembering therein his bearing the matters of Calays and his bruit that the said Mr. Wallop should be fled out of Fraunce. “The French king's advice that the King's Mate should look well upon these things, and that he would send a gentleman to congratulate these good news. “That the Constable rejoiced at those newes, saying he was gladder of the same then to have had l. m1 crownes. “The repetition of the same news to the Constable and after to the Cardinal of Bellie apart. (fn. 14) “Cardinal Belly saide that Catilion shewed him at his coming out of England, that ij honest men of reputation here had saide unto him that the said late Privy Seal intended to make himselfe k[ing of] England when his tyme might serve him. “The said Cardinal's desire that Mr. Wallop should write this matter to the Kinges Mate, not doubting but Catilion would at all times justefy the same. (fn. 15) “The lyke sayeng of th'embassador of Portugal for common brute, and also that he shulde have the ladie Marie in mariage. “That the Turk will come into Hungary with iiij cml men. “No likelihood of agreement between the French king and th'Empero1 but that they shall continue in the peace and terms they now stand. “The French king intendith to send mo men into Piemont and to cut a passage in the mountains of Savoye. 2. Another copy, much mutilated. 793. Pate to Henry VIII. I received your letters of the 7th on the 10th inst. Could not proceed at once, as the Emperor was hunting for two days. Had audience of him the morrow after his return, and was lovingly entertained, most of his chamber being Burgundians anxious to renew the old amity. The Emperor said you had written to him for the delivery of a rebel (fn. 18) and certain fugitives, for whose apprehension I had desired a general commission, and the Emperor had agreed to banish them, but said it was against his honour to deliver them up. I desired him not to let Francis surpass him in kindness to you, for Francis had granted an instrument under his broad seal for their apprehension, which had taken effect on the principal party, (fn. 18) as it did on his adherents, if he had not saved himself by flight. 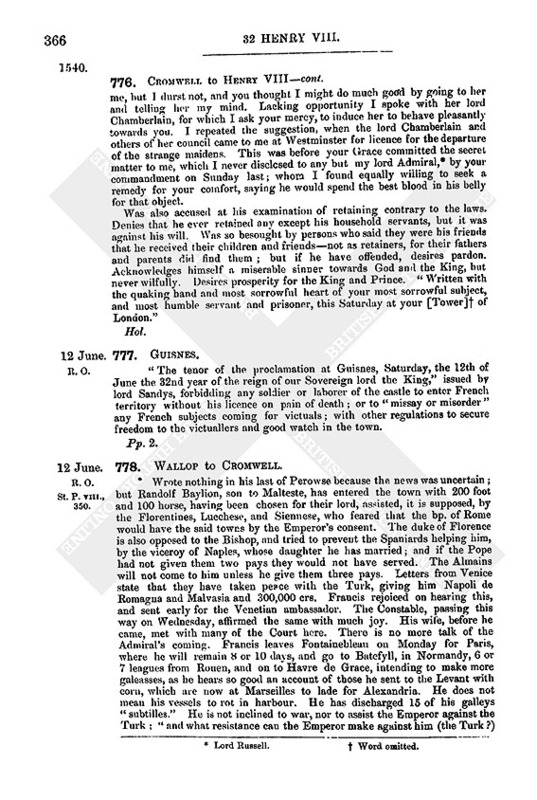 The Emperor said that treaties with France required delivery of rebels, but “none like hath been, quoth he, of our parts.” Pressed the Emperor further on the danger of having “the boy maintained in his parents' mischief,” and was impatiently referred by him to Granvelle. Saw Granvelle, the second day after, and had for final answer that the Emperor esteemed your Majesty for his loving cousin and had acted accordingly in restraining the Bishop of Rome's excommunication throughout both Spain and his other dominions, and would maintain no rebel of yours on notification that he was such, and had now given orders to the duke of Ascote to banish them. Also that the ambassadors of France, to whom they often resort, had informed him of these fugitives a day before Pate. Commends the bearer's diligence in this matter. Brussels, 16th of this present. Hol., p. 1. Add. Endd. : 16th of June. “Your honourable lordships shall understand” that on the 13th I received your letters dated the 10th, touching the offences of the lord Privy Seal, of which I was to inform the Emperor. I did so accordingly four hours after receipt, “his Majesty, nothing moved therewith outwardly, only demanding after his manner: What! Is he in the Tower of London and by the King's commandment? I affirming the same so to be.” The Emperor has despatched a post to the Bishop of Rome and the Perugians to exhort them to unity. The Venetians have given, besides Romulia and 200,000 ducats, 100,000 more and a stronghold called Malveseta to the Turk for peace. Ambassadors are coming from Cleves and Gueldres. It was rumoured that the King was dead about the 10th. The report came from Antwerp, but the Nuncio here being told it said, “No, it is not so, but another thing there is that I know right well.” An Englishman spread it. Brussels, 16th of this present. P.S.—The Emperor left yesterday for Gaunt, whence after three days he will proceed to Bruges to remain three weeks. Cardinal Nicastro, lately sent by his master to the diet of Spires, has been stayed by the Emperor, who thinks his presence will do more harm than good. This messenger has deserved thanks for his diligence about the Irish rebels, still, as Pate thinks, in Valentia, ready to go to Cambray by the Bishop's invitation. Signed. 795. Wm. lord Sandes to Henry VIII. Arrived at Calais on Monday, the 7th inst. 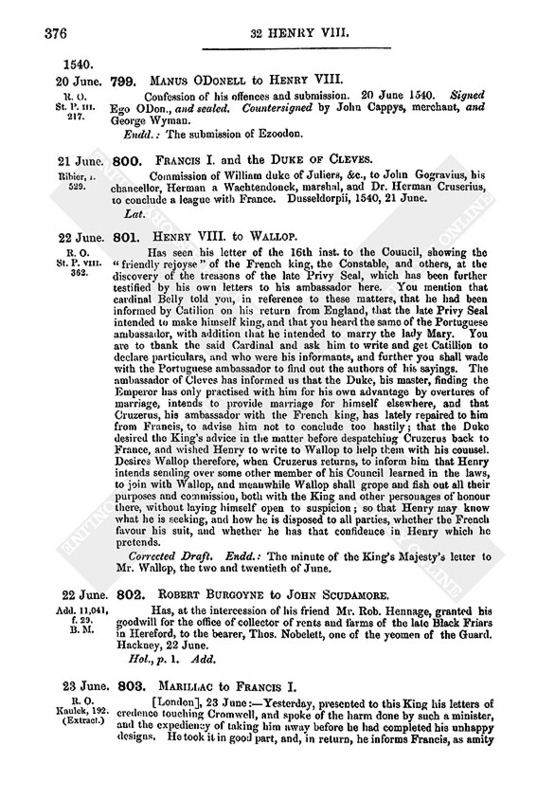 Declared on Tuesday to my lord of Sussex and Sir John Gadge, in presence of the council of Calais, the King's commands touching the Couswade, and it was arranged that lord Grey, captain of Hampnes, and John Ruckwood should repair thither and examine the King's tenants, how many of them occupy the said Couswade, what cattle they keep thereon, and what hay they have thereof. On Wednesday they returned bringing certain tenants of Marke and Oye, who showed that the King's tenants occupy peacefully, and certain Frenchmen also occupy there with 40 beasts, without interference on either part. As for the watch-house made by the French at Cowbridge, the tenants as yet sustain no disturbance thereby, but pass daily to and fro freely. It is also thought that whereas the Holehed is scoured and cast as usual, if the ways made by the Frenchmen by the said Holehed be cut away the river will drown the marsh on this side, and they can take no objection to it as it is upon English ground. The frontiers are quiet. De Buise lies at Arde and has issued a proclamation that no Frenchman on pain of death shall mis-say or illtreat Englishmen. Sandes accordingly issued a similar proclamation since his coming on Saturday, the 12th. There are 1,000 workmen on the fortifications at Arde, and of men of war, 300 foot and 200 horse, besides comers and goers. Their fortifying is of stone, faggots, turf, and earth, and but little brick. On Sunday, 13th, De Buyse sent him a gentleman, his kinsman, whom Sandes entertained gently and who returned to Arde after dinner. On Tuesday, 15th, De Buyse sent him a piece of red deer. Thinks these messages are mainly to spy, but he receives them with courtesy. The fortifications of this castle were begun a fortnight before his coming, and at this present there are not 4 lowpes in the vamure of the keep completed, nor will be till the end of next week. Of “trewelles” there are not here above 25. Had made 3 books of the ordnance necessary for the castle, of which he delivered one to the lord Privy Seal, the second to Mr. Secretary Sir Thos. Wrythesley, and the third to Sir Chr. Morres. Is disappointed that the parcels have not come. Sends the fourth book containing all the contents of the previous three. Begs to know the King's pleasure touching the security of the castle and town. Guisnes, 17 June 32 Henry VIII.Signed. There is here much talk about the castle of Ardes, and wonder expressed that the French are allowed to build so near our noses. The French ambassadors were yesterday refused an audience of Grandveale, for the time, whatever it meant. Gaunte, 17 June. 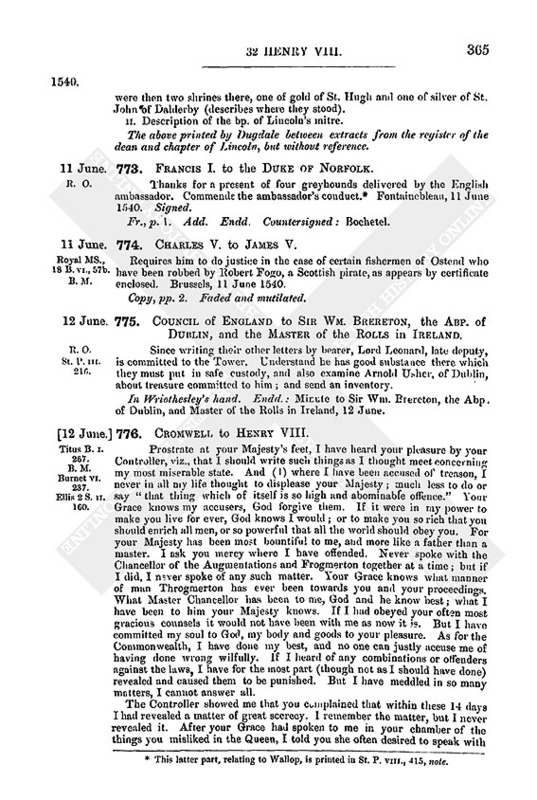 Forwards letters from Grandveale to the Emperor's ambassador. The 6,000 ducats required of Antwerp, Louvain, Brussels and Baldocke (Boisle-Duc) have been granted after some hesitation. A Frenchman at Antwerp has reported he had good trust to see Calais shortly theirs. Signed. 797. Mont to Henry VIII. Came to Hagenau 15 June, where the diet is now held. There are here, Ferdinand, as the Emperor's deputy, Louis Elector Palatine, Henry duke of Brunswick, Eric, his uncle, and commissaries of such other princes as the Marquis Elector of Brandenburg, the dukes of Bavaria, the duke of Cleves, duke of Lorraine, the dukes Otto Henry and Philip Palatine, duke Rupert a Gemino Ponte, and the marquis of Baden; also counts and ecclesiastics. The greater part of the diet are clergy, “nam modo hic certant pro gente et imperio.” Among them are the bps. of Spires, Augsburg, Trent, Passau, Bremen, and Vienna, and deputies of almost all the rest, as Bamberg, Wirtemburg, Achstet, Salsburg, Munster, Treves, Cologne, Mentz; these three ecclesiastic electors are also on the way hither. The French ambassador Lazarus Baivus is here, and Aleander, the papal nuncio with Ferdinand; also the ambassadors of Venice and Bohemia. The Protestants have not arrived, and it is not known whether they will come themselves or send ambassadors. They have quarter-masters here, and quarters are assigned for 400 horses. They have a diet of their own not far from Frankfort, at Darmstadt, a town of the Landgrave, from which they will send communications to the King and the other princes. It is said a new legate is coming from the Bishop of Rome to trouble these councils and warn them to do nothing without the Bishop's consent; just as last year he disliked the diet promised at Frankford, and wished to accuse the bp. of Lunden of treason to the Emperor for promising it. It is suspected this diet is not summoned for the public weal, but only to gain over those princes who have not yet taken sides against the Protestants. Even the mode (described) in which it was summoned, as well as other circumstances, shows it was partial. The French ambassador has made no communication except to Ferdinand, and is said to have made him large promises of aid in support of the old faith. Many fear that private interests and feuds will obstruct a settlement of religion as between the Emperor and the king of Denmark, the duke of Wurtemberg and the princes of Bavaria, Henry duke of Brunswick and the Landgrave; also between the duke of Saxony and the abp. 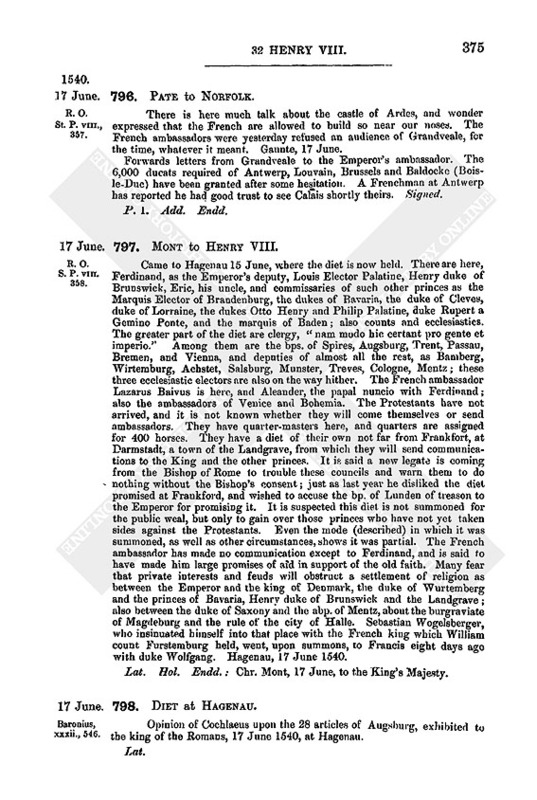 of Mentz, about the burgraviate of Magdeburg and the rule of the city of Halle. Sebastian Wogelsberger, who insinuated himself into that place with the French king which William count Furstemburg held, went, upon summons, to Francis eight days ago with duke Wolfgang. Hagenau, 17 June 1540. Lat. Hol. Endd. : Chr. Mont, 17 June, to the King's Majesty. Opinion of Cochlaeus upon the 28 articles of Augsburg, exhibited to the king of the Romans, 17 June 1540, at Hagenau. 799. Manus ODonell to Henry VIII. Confession of his offences and submission. 20 June 1540. Signed Ego ODon., and sealed. Countersigned by John Cappys, merchant, and George Wyman. Endd. : The submission of Ezoodon. 2. 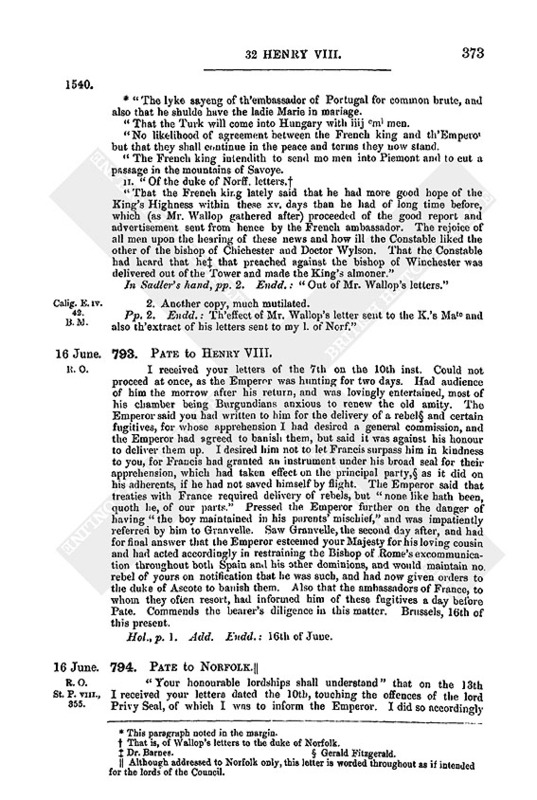 This latter part, relating to Wallop, is printed in St. P. viii., 415, note. 8. § 3 adds “Betwixt Argentyne and Hagenoe be iiij miles. 10. See Sandes' letter of the 17th June, No. 795, which shows that these abstracts go further down than the initial date. 11. See No. 498 p. 219, cc. 75 and 77. 14. This paragraph noted in the margin. 15. This paragraph noted in the margin. 16. That is, of Wallop's letters to the duke of Norfolk. 19. Although addressed to Norfolk only, this letter is worded throughout as if intended for the lords of the Council.